In collaboration with campus partners, the Assistant Director’s primary focus will be to support and create opportunities for students to become socially responsible citizens committed to building a more just world. The Assistant Director provides oversight for ten student Service Organizations, two residential service theme communities and the Ignatian Service Corps – LMU’s post-graduate service program. The position works closely with our LMU service organizations, and it also is the main point of contact for students interested in post-graduate service. Direct the Service Organization Council and advise LMU’s ten Service Organizations. Work in conjunction with service organization leadership to create norms and set policies and procedures for each of the organizations. Direct the Ignatian Service Corps (ISC), LMU’s post graduate volunteer program for recent graduates interested in doing 11 months of community service. Manage relationships with ISC placement sites located throughout Los Angeles and oversee the recruitment and application process. Lead the University post-graduate advising program. Develop and maintain relationships with more than 25 organizations that actively recruit students in their senior year for post-graduate volunteer work. Develop policies and procedures in collaboration with Residence Life staff for two theme-housing programs: Center for Service and Action House and the McCarthy Experience in Service and Action (MESA). Actively advise program and service activities, as well as provide leadership development opportunities for the students involved in these communities. Supervise the On-Campus Service Requests System. Supervise a wide variety of student service programs and activities such as the annual Hunger Banquet, semi-annual Blood Drives and annual Service Retreat. Represent LMU within the community service and post-graduate service communities, professional organizations or associations, and serve on committees and boards as required. Perform other duties as assigned or requested by the Associate Director of the Center for Service and Action. Minimum 4 years of student program management and development experience. Demonstrated knowledge in the areas of: student leadership development, program development and evaluation, group and individual student advising, experience with post-graduate service programs and leading student reflections. High level of cultural competency, including sensitivity to issues of race, class, and the ethical dilemmas that may arise from the development of strong reciprocal campus and community partnerships. Ability to establish and maintain collaborative relationships with faculty, staff students and community leaders. Demonstrated computer competency and preferably knowledgeable of MS Office, web design, and on-line survey software. Availability to work nights and weekends when necessary. Required Education: Typically a Masters Degree in student development, higher education administration, social work, public administration, non-profit leadership or another related field or equivalent experience. Upon returning to La Esperanza after a few weeks away, my biggest desire is to visit the 35 families involved with our mobile wheelbarrow library. I fill my wheelbarrow with books and hit the road after a night of heavy rains. The path along the railroad tracks, which serves as Main Street, is full of gullies and holes. “Libro” (book), Brandon shouts excitedly. He’s one of the library’s youngest clients. I then make another stop at Julie’s. She’s a bit taken aback by my long delay and asks where I’ve been. As soon as she hears “visiting my mother,” she is satisfied and takes a few books. The path continues to become rougher, and one book pops out of the wheelbarrow into the mud. As I pick it up, a woman and little girl pass by. “Would you like a book?” I ask. Only the woman turns and approaches. The girl keeps walking, but when she discovers the woman is no longer at her side, she stops, turns, and walks toward us. Many times I have seen this girl along the tracks. Her eyes are like dark stones staring up from the bottom of a river. Her forehead and neck are slightly too large; her mouth twists in. Whenever I’ve asked her if she wants a book, she turns her copper-toned face away so quickly that her brown hair swings around her head like some veil. Then she runs and hides. Leslie has now become a regular of Rick Dixon’s wheelbarrow library. The tall, slender woman says that she’s been wanting a book but hasn’t seen me for a while. I explain that I’ve been away, and she introduces herself as Jasmine and her daughter as Leslie, who is now hiding behind her mother. Jasmine takes a book from the wheelbarrow—Doley, the Guatemalan Street Dog—and shows it to her daughter. “Do you want this one?” she asks, speaking very slowly. Leslie doesn’t respond, so the mother points to the book and then to Leslie. “My daughter doesn’t hear or speak well,” she says. “I’d like to read a book and sign the story to her. We’re learning sign language.” When she opens the book, the girl’s eyes blossom wide. The page shows a volcano with the sun’s colors all over it. Doley is barking up at two quetzals in flight. The text says, “Doley keeps birds up in the sky.” Leslie takes the well-used book as if it were a Christmas vision. Since then, I’ve made a few rounds of book lending to Leslie and Jasmine. The last time I asked the mother how to say “How are you” in sign language. She placed open hands on each side of her heart and fingered them up to her shoulders and then put two thumbs in the air. A few days later, I saw Leslie returning home from school and asked how she was. Her face opened curious and tender but then she grinned with wincing eyes, conveying that my sign language clearly needed a lot of practice. So I went home and spoke in finger and thumbs in front of a mirror until I could feel “How are you” as a rhythmic and fluent place from the heart. I look forward to seeing Leslie again, to see how I’m doing with my new language. Rick Dixon is a Maryknoll Lay Missioner serving in the La Esperanza community of Cojutepeque. His ministry takes place in a squatter settlement that dates back to the Salvadoran civil war. He promotes education, family literacy, and adult and youth skills training to help people develop confidence, leadership skills, self-esteem and handicraft abilities. Maryknoll Lay Missioner Coralis Salvador, right, exchanges thumbs-ups with Ali, a boy in the HOPE Project, as social worker Floriana Mwandoe looks on. Coralis Salvador quotes part of a homily a Kenyan priest gave many years ago: “We are the body of Mary and we give birth to Jesus … not by words but by how we relate to one another.” That message, she says, has kept her on the path she has traveled for almost 18 years as a Maryknoll lay missioner in Mombasa, Kenya. Today we are walking through Gwanahola, a slum on the western outskirts of Mombasa, as Coralis, wearing a giant sun visor, takes us on that path. As we pass little shacks of mud, cardboard or recycled wooden crates, with tin roofs and mud floors, residents give us a friendly wave. We come to the home of Nazmin, a tiny woman with a bashful smile, who is HIV-positive. (Her name and the names of other clients are pseudonyms to protect their identity.) Nazmin introduces her 9-year-old son, Ali. He is not only HIV-positive but also deaf. He attends a special school, with costs and uniforms covered by the HOPE Project, which Coralis administers. HOPE, she says, is an acronym for Helping Orphans Pursue Education. Coralis explains that the HOPE Project is an offshoot of a community-based health care and AIDS relief project, Mombasa Catholic CBHC, which was started by the late Maryknoll Brother John Mullen in 1997 and modeled after a similar project in Nairobi. HOPE began in 1999 to assist children of CBHC clients. It has served more than 2,600 children. Coralis Salvador, right, walks with (from left) Mary Mwandingo, Floriana Mwandoe and Nazmin through the Gwanahola slum in Mombasa, Kenya. On our walk we are joined by Floriana Mwandoe, a social worker and counselor, who will take over Coralis’ job when she retires at the end of 2019. Mary Mwandingo is also with us. She is one of 400 community health volunteers (CHVs) who visit the sick in their neighborhoods, identifying children in need and helping them get back to school. Mary gives Nazmin some welcome gifts of milk, flour and beans. She explains how essential proper nutrition is for staying healthy while living with AIDS. Fifteen years ago in Mombasa, those with HIV were virtually under a death sentence. Since 2005, thanks to the widespread use of antiretroviral medicines—which are free in Kenya—people with HIV can go on living normal, healthy lives if they continue taking their prescriptions. Part of the work of the volunteers is to ensure clients take their medication every day. 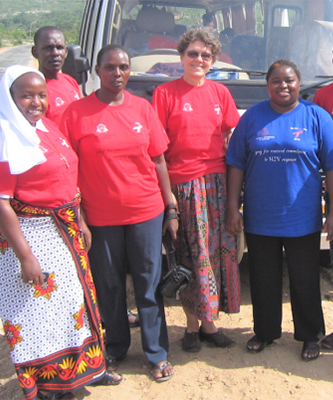 Under the auspices of the Catholic Archdiocese of Mombasa, the health volunteers receive training at workshops run in each of 11 parishes by visiting nurses and clinical officers. They discuss their work in the communities and share the feelings that inevitably come in performing such a heartrending ministry. “As they go from house to house, they must be totally fresh and not carry accumulated emotions around with them,” Coralis explains. Coralis Salvador, left, with Mary Mwandingo, a community health volunteer, and social worker Floriana Mwandoe visit a school where the HOPE Project donates uniforms to needy students. Moving on, we come to the home of Mariamu, who has had AIDS for many years. She is skin and bones but has an enormous smile. She and her healthy daughter, 12-year-old Halima, live in a single room off a courtyard shared by several families. It is stiflingly hot and dark inside their home. Coralis gives mother and child a hug while Mary gives them flour, beans and milk. Halima is a HOPE client. Receiving a uniform and supplies, she attends a local primary school that otherwise would have been unaffordable, despite school being officially “free” in Kenya. It is the required extras that cost and so exclude many children from education. HOPE, Coralis explains, also runs a learning center that provides additional schooling for children on Saturdays. During school holidays the kids come three or four times a week for tutoring and a light meal. The center keeps them off the streets while providing a safe place offering workshops, sports and library books. Coralis, who was born in the Philippines, says she became sensitized to the needs of people with HIV and AIDS when she lived in San Francisco, Calif., in the 1980s and knew many people who died of the virus before medication was available. After her children had flown the nest and Coralis was pondering what next, her parish priest suggested she apply to the Maryknoll Lay Missioners. “I contacted them, got approved and here I am, in Kenya since 2001!” she says. A short-term volunteer, L. Susan Slavin, once came to help in Mombasa and was so moved by Coralis’ work that the two women co-authored an Orbis book titled, What’s so Blessed About Being Poor? Coralis explains that serving and living in the moment in Africa may sound easy, but it takes a long while to get there. “We have so many attachments and fears and you need to totally surrender,” she says. Coralis has truly surrendered herself in Africa. She has renewed her contract with the Maryknoll Lay Missioners several times. Walking with Coralis, along with Floriana, Mary and the other health volunteers and seeing their love for the people they serve, is indeed seeing Jesus born today. For 28 years, Mary D’Arcy served MKLM as staff psychologist. Among the many gifts Mary D’Arcy shared with her beloved Maryknoll family was her remarkable ability to be present. “When Mary sat down with you, it was as if you were the only person she had ever worked with, or even the only one in the world,” says Sam Stanton, former director of the Maryknoll Lay Missioners. Mary served as staff psychologist for MKLM from 1976 to 2004 and after her retirement volunteered her services. She died on Aug. 2, 2017, but her contributions to mission are not forgotten. Mary Gray was born in Meadville, Pennsylvania, on Oct. 25, 1930. She and her twin sister, Marie, together entered the Maryknoll Sisters in 1948. After completing a bachelor’s degree in education from Maryknoll Teachers College, Mary spent 11 years as a missioner in Peru and Bolivia. Returning to the United States, she earned a master’s degree in psychology from Fordham University. Eventually she left the Maryknoll Sisters and married Paul D’Arcy, a former Maryknoll priest. They had a loving marriage and raised two sons. Mary maintained a lifelong connection to the Maryknoll Sisters through the Congregation’s “Full Circle” association for former members. She also belonged to the Maryknoll Affiliates’ Subway Chapter in New York City. Deirdre Cornell is a former Maryknoll Lay Missioner who served in Mexico. She is author of three Orbis Books, including Jesus Was a Migrant and American Madonna: Crossing Borders with the Virgin Mary. 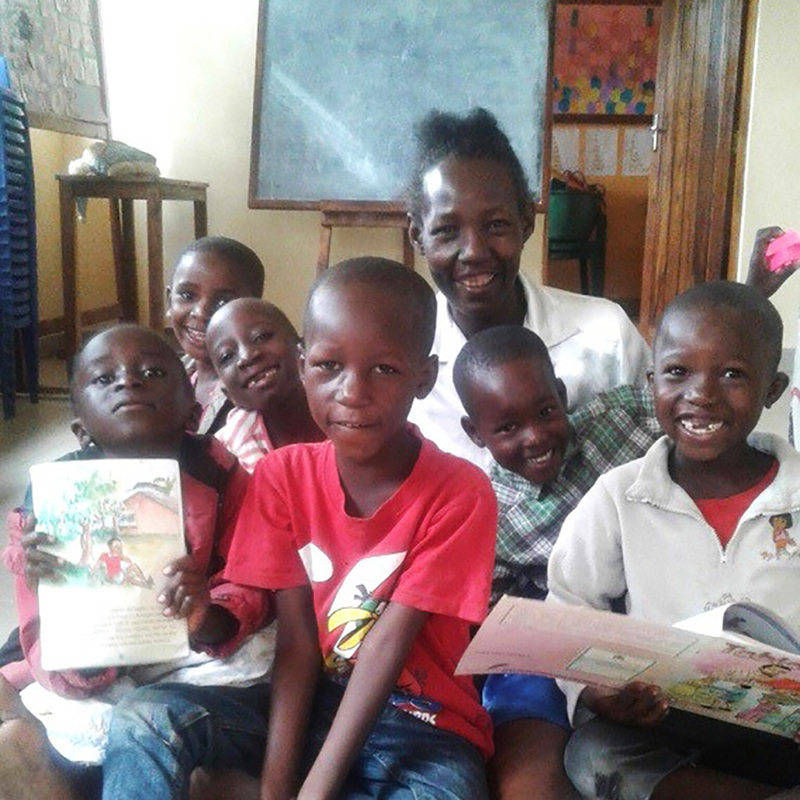 Rehema Nyorobi with children at the Shalom Kindergarten in Mwanza, Tanzania. As we near the celebrations of Thanksgiving and Christmas, we remember with special gratitude the life of Rehema Nyorobi. Rehema recently passed away after a brief illness at age 50. Thankfully her children are being well cared for by other family members. Rehema had a way of uplifting the lives of all those she was with. When we first met, I asked Rehema to help me clean our Shalom Kindergarten classroom a few days before school. We were on our hands and knees with soap and water, but we had such a good time visiting with each other that we forgot the time. From that day forward, no matter how simple our activity, our companionship was blessed. Being in the company of such a loving and cheerful person who was always so good to the children and to me was a gift I’ll never forget. Somehow I believe she is still blessing us, and is blessed herself in heaven. In the midst of war and suffering, a lay missioner reflects on the hope he sees in the good people of South Sudan. Gabe greeting primary students at Tambua. YAMBIO, South Sudan — So much of the news in South Sudan has to deal with the problems this young country is facing. We hear of the constant and unremitting fighting going on all over the countryside. “Roads are not safe, don’t go out at night, stay away from certain places, watch what you say!” We hear of the famine. We hear of disease. We hear of every plague under the sun. We hear of the recent Peace Agreements and that everyone is skeptical. This sort of environment wears on a person and can slowly make one cynical. Today I want to write about a positive spirit of South Sudan that I have noticed in just the short time I have been here. These types of stories don’t seem to make the headlines. Yet there are so many times when I see Jesus in the people around me. Children playing in a wheelbarrow in Yambio, South Sudan. Sister Margaret, Sister Peg and I went shopping one day. Sister Margaret had inadvertently forgotten something she had bought. The merchant trailed her down the streets to give it to her. “Here, Sister. You forgot this!” Now that is service with a smile. Since I have been helping with the shopping on Saturdays this has happened several times. Sister Margaret told me that one time a merchant had actually come all the way out to the college to deliver a purchased item that had inadvertently been left in the store. It is heart-warming to know there are good people in this world and honest merchants. Father Awassa was confronted with an emergency. He had to get a handwritten letter to Juba from Yambio today. He called the local airline company and, yes, there would be a plane arriving in a short time, but he must hurry to get the letter on board. Father Awassa finished the letter and rushed to the airport. The plane was already boarding when he handed the letter to the official. But Father Awassa did not know that there was a fee for the service. He had left in such a hurry he had no money whatsoever on him. He started to plead and beg the official that he would pay but for now he had no money. The official was not in a cooperative mood. He refused unless he got the money. A motorcycle taxi driver was listening and quite enjoying the back and forth between the priest and government official. Finally, it looked like the letter would not go. It was then that this complete stranger stepped up and said, “Father, let me pay for the letter.” Father Awassa was amazed—taxi drivers work hard but are poor and rarely have money. The man started to pull out of this pocket and that pocket all sorts of wrinkled and dirty notes. He slowly collected enough South Sudanese pounds to pay the official for the letter delivery. Then the “Good Samaritan,” as Father Awassa called him, drove off. Father Elia is a kind-hearted and soft-spoken priest. His spirit of serving his parish is so strong despite all the challenges and difficulties. He rarely thinks of his own problems and is always helping others. One day the people brought him a tortoise. He adopted that one and several more that the people found. When Father Elia went on a sabbatical for the first time in years and years, he brought the tortoises to our Solidarity Teacher Training College. Why? Because he knew we would take care of them. If he left them in his parish, he suspected the people would eat them. “There is too much killing in South Sudan. These tortoises deserve life too.” said Father Elia. Ali was terrorized by Sudanese soldiers as a youth. They threatened to kill him two times and he was conscripted as a child soldier. Finally, after escaping, he moved from place to place until landing at our college in Yambio. He went through the Trauma Healing Course and found that it took away his nightmares. He is calmer now. He still uses the techniques when he feels the anger and anxiety rising in his heart. He is grateful to Solidarity with South Sudan for helping him heal. Children getting water during school break. A priest in a neighboring area asked Solidarity for help. He himself cannot go back to his parish area at the moment. The governor of that area wants him dead for speaking out against the abuses officials have perpetuated upon the people. He worries about a group of women who were kidnapped into the Lord’s Resistance Army (LRA) some time ago. This is an evil group that runs around the jungles of central Africa killing and looting. No one has been able to stop them so far. These women somehow escaped the LRA with the children they had after being raped by the LRA fighters. Now they are shunned by society because they have this history of being in the LRA. They are forced to eke out a living in remote areas of the jungle. But they need help and the local community decided they will help them. The community will send two members to Solidarity to be trained as teachers. Not the first for Solidarity. STTC currently has two other graduates teaching in the bush to an isolated community. Amongst the violence and chaos, God is present to His lowly ones. I was talking with some people outside our college. As we stood there chatting I felt something wet in my hand. I looked down and a little girl had come up and just put her cold, sweaty, little hand in mine. She wanted to greet the foreigner. I greeted her in the usual English, “How are you?” and she replied, “I am fine.” In Zande I then asked her name. “I am Isabella,” she said with a toothless smile. “How old are you, Isabella?” “I am 4.” Then off she went to play with her friends. She didn’t know it, but she made my day. I thought about Isabella all day long and said a prayer for her every time she came to mind. She is the future of South Sudan. Her smile gives me hope that the future of South Sudan will change. All of these stories show us that there is hope. There are always good people in every place at every time. They outnumber the bad people. They just don’t get the press or attention. Thank God, the Holy Spirit moves among and in us. Gabe Hurrish (MKLM Class of 2017) is a teacher at Solidarity Teacher Training College in Yambio, South Sudan, and works with Solidarity with South Sudan. All photos courtesy of Gabe Hurrish. The statement, which was published online on November 5, called on the United States to work to transform our relationships with our southern neighbors to enable livable communities to flourish everywhere. As the procession of desperate people from Central America walks its way north through Mexico bound for the United States, the leadership of the four organizations that share the Maryknoll name, the Maryknoll Sisters, Maryknoll Fathers and Brothers, Maryknoll Lay Missioners, and Maryknoll Affiliates, call on the leaders of the United States to listen to the cries of an oppressed people and to respond with compassion and dignity worthy of our nation. With each difficult step, the caravan’s members are asking the people of the United States to prepare, to open our arms and hearts, and to listen to the stories they have to tell – stories of violence, hunger and persecution, of pain, fear and hope. As these vulnerable people approach, some with babies in their arms, many children themselves, we, as a community of Catholic men and women who have a long history in Central America and know their plight first hand, feel profoundly close to these sojourners and unequivocally reject President Donald Trump’s characterization of the caravan as an “invasion of our country.” The migrant caravan is a humanitarian crisis, not an invasion. The Trump administration is abandoning the United States’ historic moral vision as a beacon of freedom and hope. Instead, we say ‘Welcome, brothers and sisters.’ Refuge is a right. Asylum is the law. We recognize that this dense concentration of migrants does not represent a threat but a survival strategy to protect themselves from assault, exploitation, and theft on the dangerous journey to safety. Saint Óscar Romero taught us, “When the church hears the cry of the oppressed it cannot but denounce the social structures that give rise to and perpetuate the misery from which the cry arises.” Inspired by love, we call on the United States to act with compassion toward migrants and to work to transform our relationships with our southern neighbors to enable livable communities to flourish everywhere.